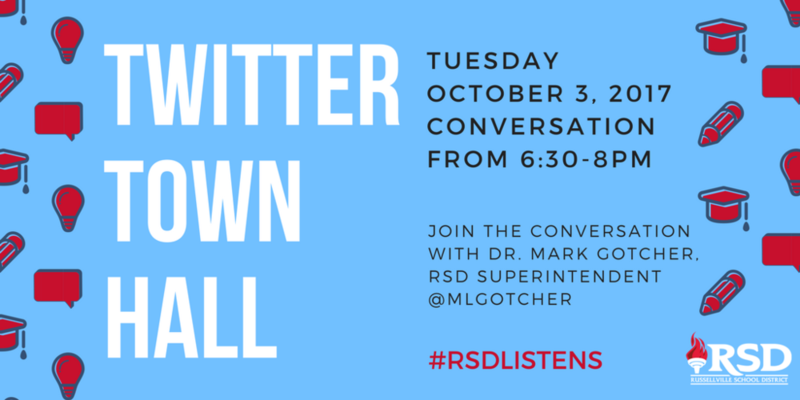 Russellville School District Superintendent Dr. Mark Gotcher will host a Twitter Town Hall on Tuesday, October 3, 2017, from 6:30-8 p.m. on the social media platform Twitter. During the town hall, participants will have the opportunity to give feedback on three questions: what does RSD need to start doing, what does RSD need to stop doing, and what does RSD need to continue doing. The three questions will be released at different times throughout the evening on Dr. Gotcher’s Twitter account @mlgotcher. Participants are asked to use the hashtag #RSDListens when responding to the questions. Dr. Gotcher will be in the Board Room at the Administration Building during the Twitter Town Hall. Community members, parents, and students are welcome to attend and view the tweets as they come in. The district will also release an online survey with the same questions for anyone who wants to give feedback, but doesn’t want to participate in the Twitter Town Hall. The Twitter Town Hall is part of Dr. Gotcher’s Listen and Engage Plan that includes gathering feedback from students, parents, and community members in the River Valley.